For the 1965 film of the same name, see Operation Crossbow (film). The original 1943 code name Bodyline was replaced with Crossbow on November 15, 1943.:4 Post-war, Crossbow operations became known as Operation Crossbow as early as 1962, particularly following the 1965 film of the same name. In May 1943 Allied surveillance observed the construction of the first of eleven large sites in northern France for secret German weapons, including six for the V-2 rocket. In November it discovered the first of 96 "ski sites" for the V-1 flying bomb. Officials debated the extent of the German weapons' danger; some viewed the sites as decoys to divert Allied bombers, while others feared chemical or biological warheads. When reconnaissance and intelligence information regarding the V-2 became convincing, the War Cabinet Defence Committee (Operations) directed the campaign's first planned[a] raid (the Operation Hydra attack of Peenemünde in August 1943). Following Operation Hydra, a few Crossbow attacks were conducted on the "Heavy Crossbow" bunkers of Watten (V-2) and Mimoyecques (V-3) through November. "Crossbow Operations Against Ski Sites" began on December 5 with the "Noball" code name used for the targets (e.g., 'Noball 27' was the Ailly-le-Vieux-Clocher [sic] site,:49 "Noball No. 93" was in the Cherbourg area, "Noball No. 107" was at Grand Parc, and "Noball V1 site No.147" was at Ligescourt). The US formed its own Crossbow Committee under General Stephen Henry (New Developments Division) on December 29, 1943, and the US subsequently developed bombing techniques for ski sites in February/March 1944 at the Air Corps Proving Ground (a June plan to attack V-1 launch sites from aircraft carriers with USMC fighters was disapproved). V-2 facilities were also bombed in 1944, including smaller facilities such as V-2 storage depots and liquid oxygen plants, such as the Mery-sur-Oise V-2 storage depot on August 4, 1944 and, by the Eighth Air Force, which bombed five cryogenic LOX plants in Belgium on August 25, 1944 and aborted the next day "to hit liquid oxygen plants at La Louviere, Torte and Willebroeck, Belgium ... due to clouds." At the request of the British War Cabinet, on April 19, 1944,:24 Dwight Eisenhower directed Crossbow attacks to have absolute priority over all other air operations, including "wearing down German industry" and morale:46 "for the time being", which he confirmed after the V-1 assault began on the night of June 12/13, 1944: "with respect to Crossbow targets, these targets are to take first priority over everything except the urgent requirements of the Overlord battle; this priority to obtain until we can be certain that we have definitely gotten the upper hand of this particular business" (Eisenhower to Arthur Tedder, June 16). The launches surprised the Allies, who had believed that the earlier attacks on the sites had eliminated the danger. The British, who had not expected German bombing of Britain to resume so late in the war, were especially upset. Some suggested using gas on the launch sites, or even executing German civilians as punishment. Nonetheless, over a quarter of the Combined Bomber Offensive's tonnage of bombs were used against V-weapon sites in July and August; many of the attacks were ineffective, as they were against unused sites rather than the launchers themselves. Spaatz unsuccessfully proposed that attacks concentrate on the Calais electrical grid, and on gyrocompass factories in Germany and V-weapon storage depots in France. The gyrocompass attacks, along with targeting liquid oxygen tanks (which the Allies knew the V-2 needed), might have been very effective against the missiles. On August 25, 1944, the Joint Crossbow Target Priorities Committee (established July 21) prepared the "Plan for Attack on the German Rocket Organization When Rocket Attacks Commence"—in addition to bombing of storage, liquid-oxygen, and launch sites; the plan included aerial reconnaissance operations. :37 Following the last V-1 launch from France on September 1, 1944, and since the expected V-2 attacks had not begun, Crossbow bombing was suspended on September 3:34 and the campaign against German oil facilities became the highest priority. The V-1 threat from occupied France ended on September 5, 1944, when elements of the 7th Canadian Reconnaissance Regiment and the 3rd Canadian Infantry Division contained the German military units of the Nord-Pas de Calais area with their surrender following on September 30. Crossbow bombing resumed after the first V-2 attack and included a large September 17 raid on Dutch targets suspected as bases for Heinkel He 111s, which were air-launching V-1s. :37 Modified V-1s (865 total) were "air-launched" from September 16, 1944 to January 14, 1945.:104 The British had initially considered that an earlier July 18–21, 1944 effort of 50 air-launched V-1s had been "ground-launched" from the Low Countries, particularly near Ostend. :256 In addition to air-launched V-1s, launches were from ramps built in the province of South Holland, the Netherlands in 1945. A Spitfire tipping the wing of a V-1 to disrupt the missile's automatic pilot. On January 2, 1944, Roderic Hill submitted his plan to deploy 1,332 guns for the air defence of London, Bristol and the Solent against the V-1 "Robot Blitz" (the "Diver Operations Room" was located at RAF Biggin Hill). :96,161 Against V-1s that had not run out of fuel or veered off course the British deployed select units of Fighter Command (No. 150 Wing RAF) operating high-speed fighters, the anti-aircraft guns of Anti-Aircraft Command, and approximately 1,750 barrage balloons of Balloon Command around London. "Flabby" was the code name for medium weather-conditions when fighters were allowed to chase flying bombs over the gun-belt to the balloon line,:197 and during Operation Totter, the Royal Observer Corps fired "Snowflake" illuminating rocket flares from the ground to identify V-1 flying bombs to RAF fighters. :102 After the Robot Blitz began on the night of June 12/13, 1944, an RAF fighter first intercepted a V-1 on June 14/15. Moreover, anti-aircraft guns increased the rate of downed V-1s to 1 per 77 rounds fired after "the first few weeks[when?] of proximity fuse operation" (Reginald Victor Jones). By June 27, "over 100,000 houses had been damaged or destroyed by the V-1 ... and shattered sewage systems threatened serious epidemics unless fixed by winter." Of the 638 air-launched V-1s that had been observed (e.g., by the Royal Observer Corps), guns and fighters downed 403 and the remainder fell in the London Civil Defence Region (66), at Manchester (1), or elsewhere (168, including Southampton on July 7). :131 Additionally, the gunners on W/Cdr. S.G. Birch's Lancaster claimed they downed a V-1 over the target area on a March 3, 1945, raid on the Ladbergen aqueduct. ^ a b c D'Olier, Franklin; Alexander; Ball; Bowman; Galbraith; Likert; McNamee; Nitze; Russell; Searls; Wright (September 30, 1945). "The Secondary Campaigns". United States Strategic Bombing Survey, Summary Report (European War). Retrieved 2008-09-22. The attacks on the V-weapon experimental station at Peenemünde, however, were not effective; V-l was already in production near Kassel and V-2 had also been moved to an underground plant. The breaking of the Mohne and the Eder dams, though the cost was small, also had limited effect. ^ Krause, Merric E (June 1988). "From theater missile defense to anti-missile offensive actions: A near-term strategic approach for the USAF" (pdf). School of Advanced Airpower Studies, Air University. p. 11. Retrieved 2008-10-23. ^ a b "Total Crossbow Offensive Effort by Air Forces" (exhibit). V-Weapons (Crossbow) Campaign. AllWorldWars.com. Retrieved 2009-03-22. ^ a b Charman, Terry. "The V Weapons Campaign Against Britain 1944-1945" (pdf). Imperial War Museum. Retrieved 2013-04-09. ^ a b c d e f g Cooksley, Peter G (1979). Flying Bomb. New York: Charles Scribner’s Sons. pp. 102, 162, 197. ISBN 0-684-16284-9. ^ Russell, Edward T (1999). "Leaping the Atlantic Wall: Army Air Forces Campaigns in Western Europe, 1942–1945" (PDF). United States Air Force History and Museums Program. p. 26. Archived from the original (pdf) on 2004-06-27. Retrieved 2014-03-19. ^ Zaloga 2018, p. 92. ^ a b Hillson, Franklin J. (Maj) (Summer 1989). "Barrage Balloons for Low-Level Air Defense". Air Chronicles; Airpower Journal. Archived from the original on 2007-05-01. Retrieved 2007-05-07. ^ Huzel, Dieter K (1962). Peenemünde to Canaveral. Englewood Cliffs, NJ: Prentice Hall. pp. 116, 164, 180, 187–9. ISBN 0-313-22928-7. OCLC 1374588. This was part of the effort to knock out German's secret weapons, known ... as "Operation Crossbow". ^ a b c Levine, Alan J. (1992). The Strategic Bombing of Germany, 1940-1945. Westport, Connecticut: Praeger. pp. 136–139. ISBN 0-275-94319-4. ^ a b c d Ordway, Frederick I, III; Sharpe, Mitchell R (1979). The Rocket Team. Apogee Books Space Series 36. New York: Thomas Y. Crowell. pp. 251, 256, 262. ISBN 1-894959-00-0. Archived from the original (index) on 2012-03-04. ^ Neufeld, Michael J (1995). The Rocket and the Reich: Peenemünde and the Coming of the Ballistic Missile Era. New York: The Free Press. p. 198. ^ Sanders, T.R.B. (Sanders Mission) (February 1945). "Investigations of the Heavy Crossbow Installations in Northern France". Retrieved 2007-05-16. ^ Carter, Kit C; Mueller, Robert (1991). The Army Air Forces in World War II: Combat Chronology 1941-1945 (Scribd). Washington DC: Center for Air Force History. ISBN 1-4289-1543-5. Retrieved 2010-03-04. ^ "Forgotten Battles & Pacific Fighters through to 1946 – 52 mission scripted historical static campaign". Retrieved 2014-03-19. ^ Spaatz, Carl (June 28, 1944). "Memorandum, Spaatz to Eisenhower". Pre-Presidential File Box 115. Dwight D. Eisenhower Presidential Library. ^ a b c Eisenhower, David (1991) . Eisenhower: At War 1943-1945. New York: Wings Books. p. 349. ISBN 0-517-06501-0. ^ Craven, Wesley Frank; Cate, James Lea, eds. (January 1983). (Volume 3) Europe: Argument to V-E Day. The Army Air Forces in World War II. p. 535. ISBN 978-0-912799-03-2. 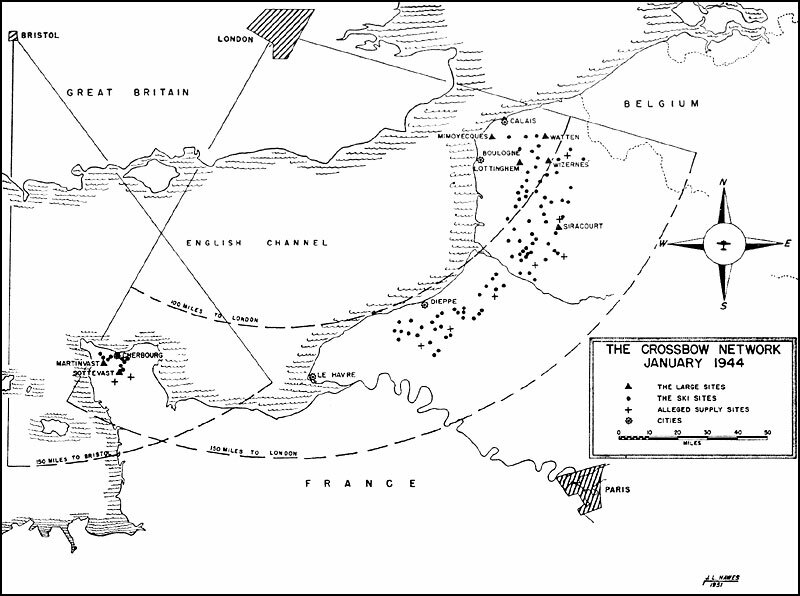 ^ Hyrman, Jan. "Operation Undergo: The Capture of Calais & Cap Griz Nez". Clearing the Channel Ports. Retrieved 2008-06-13. ^ Pocock, Rowland F (1967). German Guided Missiles of the Second World War. New York: Arco Publishing Company, Inc. p. 104. ^ Jones, R.V (1979). Most Secret War: British Scientific Intelligence 1939-1945. London UK: Coronet Books (Hodder and Stoughton). p. 428. ^ Jeff Cant (2006). "Fifty years of transmitting at BBC Woofferton: 1943-1993" (pdf). p. 6. Retrieved 2014-03-19. ^ "Den Haag (The Hague) - Wassenaar - Hoek van Holland". A-4/V-2 Resource Site. V2Rocket.com. Retrieved 2010-02-27. ^ Sandys, Duncan (October–December 1943). "Reports by Bodyline Joint Staff Committee". The Papers of Lord Duncan-Sandys. Churchill Archives Centre. Retrieved 2007-05-09. Collier, Basil (1976) . The Battle of the V-Weapons, 1944-1945. Yorkshire: The Emfield Press. ISBN 0-7057-0070-4. Gruen, Adam L. "Preemptive Defense, Allied Air Power Versus Hitler's V-Weapons, 1943–1945". The U.S. Army Air Forces in World War II. pp. 4(Round 1), 5(Round 2). Archived from the original on 2009-07-05. Retrieved 2007-05-07. Kennedy, Gregory P. (1983). Vengeance Weapon 2: The V-2 Guided Missile. Washington DC: Smithsonian Institution Press. p. 4. ISBN 0-87474-573-X. Zaloga, Steven J. (2018). Operation Crossbow 1944: Hunting Hitler's V-weapons. Oxford: Osprey Publishing. ISBN 9781472826145. Kelly, Jon (13 May 2011). "Operation Crossbow: How 3D glasses helped defeat Hitler". BBC. Retrieved 21 June 2011. Newly released photographs show how a team of World War II experts disrupted Nazi plans to bombard Britain — with the help of 3D glasses like those in modern cinemas. This page was last edited on 21 April 2019, at 03:36 (UTC).